I was recently introduced to Nuttzo 100% Organic butter: This butter contains peanuts, cashews, almonds, hazelnuts, Brazil nuts, sunflower seeds and flax seeds! It is super crunchy and amazingly healthy. 1 serving of NuttZo Original (2T) contains only 1g of sugar while providing 50% of your daily value of Omega 3 ALAs. I cannot recall the last time I used real peanut butter on anything. I have used some form of almond or nut butter in place of PB for at least the past year. 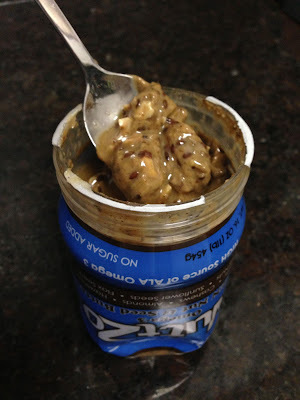 Upon opening the jar of NuttZo, I instantly noticed all the different seeds and textures. I knew instantly that I found a new butter for my morning smoothies. I try to have healthy smoothie every morning for breakfast. I try to mix things up so I don't get into a boring routine. 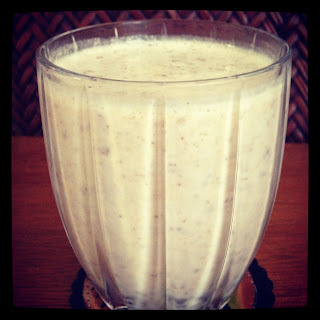 One of my favorite smoothies is a nut butter, banana and chocolate chip smoothie using Greek Yogurt and Silk Milk. The NuttZo was a perfect addition to this smoothie. Whoa. The seeds in here look amazing. I can't wait to try this!